These days, I'm reaching for anything but bright color. I don't have a specific reason or explanation why, I just seem to be enjoying a more neutral palette. I have a lot of labradorite jewelry, and I like wearing it with olive, grey, black, beige, and white. When I plan my outfits, I typically keep in mind what jewelry I'm going to wear and then dress accordingly. I know that may seem unusual! Most people keep the focal point on a pair of shoes or a great statement clothing item, but I like to pick out my jewelry and then have the rest of my look follow suit. Of course, this could change next week so I may contradict myself. I can't stop thinking about our upcoming Hawaii trip in the Summer, and I love wearing bold, vivid colors on the beach. Stella & Dot has some beautiful turquoise pieces right now so I'm waiting on an order. There's nothing prettier than a light tan and golden accessories to match the carefree feeling of Summer. I'm sure a lot of you are thinking about it too! I love neutrals! Your taupe shoes, jacket, and bag look great with your black. I too love neutrals and I love that bag! I feel like my outfit planning strategy changes by the day or based on what's newest in my closet. So if I get a new necklace I plan around that, new shoes...same thing. :) And I'm a big believer in having a healthy collection of neutrals in your closet to get the most out of your wardrobe mix & match options. These pieces are all perfect examples and great staples. SO glad you got those booties and are getting good use out of them! 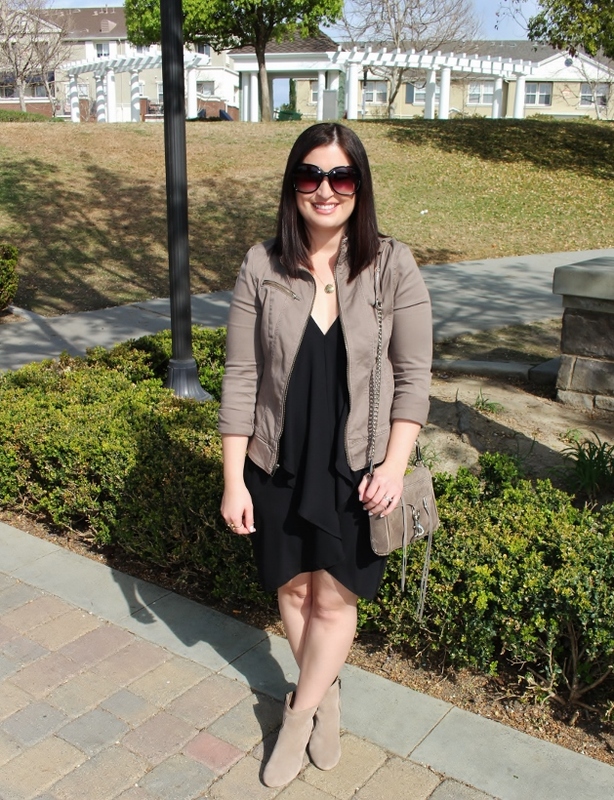 Neutrals are so pretty on you...really loving your jacket! And I am loving your logo!